A mild-mannered teen. The violent death of a parent. A mysterious superpower. A plan for revenge. These familiar comic book elements are given a fresh twist in a new graphic novel that ties superheroics to the immigrant experience. The Shadow Hero — written by Gene Luen Yang, author of the National Book Award finalist American Born Chinese, and illustrated by Sonny Liew, creator of Malinky Robot for Image Comics — reintroduces the Green Turtle, a forgotten character from the Golden Age of Comics. Together, Yang and Liew resurrected what many consider to be the first Asian-American superhero from obscurity. Yang, an Alameda native, UC Berkeley grad and math teacher, and IT specialist at Bishop O'Dowd High School in Oakland, grew up in the San Jose area, but maintains deep ties to the East Bay. As the author/illustrator of The New York Times-bestselling graphic novel Boxers & Saints, he has done much to bring Chinese history, mythology, and culture to a wider audience. On August 2, Flying Colors Comics (2980 Treat Blvd., Concord) will host a launch party for The Shadow Hero, published by First Second just in time for last week's San Diego Comic-Con. From the birth of the superhero genre in 1938, Asian characters in comic books were usually relegated to roles as Fu Manchu villains or slapstick sidekicks, rendered with yellow/orange skin tones, ridiculous buckteeth, and slanted eyelids. 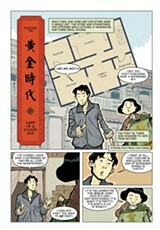 Only with the rise of independent comics publishers and creator-owned titles have Asian-American comics creators, such as Derek Kirk Kim, Adrian Tomine, and Jillian Tamaki, been able to reverse some of these stereotypes by writing about and illustrating realistic aspects of their cultures. A longtime fan of superhero comics, Yang learned about the original Green Turtle from Pappy's Golden Age Comics Blogzine, an online repository of scanned, mostly public-domain comics stories from the early decades of the medium. Not much is known about the Green Turtle's character. In 1944, a little-known publisher called Rural House hired Chinese-American cartoonist Chu Hing to create a lead character for its new series, Blazing Comics. Hing devised the Green Turtle, a World War II superhero tasked with defending China, a US ally, against the invading Japanese Army. Wearing a cape over his shoulders and a mask over his face, the Green Turtle didn't really exhibit much in the way of supernatural powers, beyond being unusually good at avoiding bullets at close range. His sidekick was Burma Boy, but not even he knew where the Green Turtle got his talents or what led him to become a superhero. Yang said that as soon as he read about the character on Pappy's blog, he was fascinated by the mysterious circumstances surrounding the Green Turtle's creation. "When you look at those original Green Turtle comics, the main character almost always has his back turned toward [the reader], so all you see is his big green cape," Yang said. "When he is turned around, something's always blocking his face: another character is standing there, or he's punching and his arm is blocking his face, or a shadow falls right over it. It's very deliberate." It is here that the history of the Green Turtle moves into the realm of speculation. One popular theory is that Hing wanted his character to be Chinese-American but his publisher wouldn't go along with the idea, afraid an Asian superhero wouldn't find any traction in a comics marketplace dominated by "all-American" Caucasian characters. "You never see comics, especially superhero comics, drawn like that," Yang said. "The rumor is that Chu Hing did it that is so he could imagine his character as he had originally intended, as Chinese-American." Whatever Hing's intentions, Blazing Comics lasted only five issues. The Green Turtle was relegated to the scrap heap of comics culture, until Yang, in collaboration with Liew, a Malaysian-born artist currently residing in Singapore, decided to give him a makeover and an origin story. 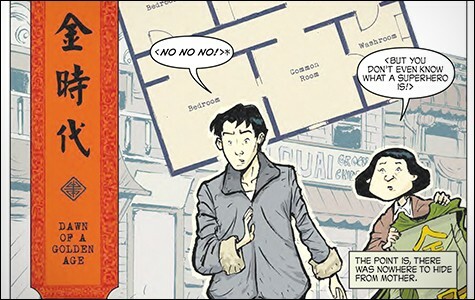 Set in the late 1930s, The Shadow Hero chronicles the adventures and misadventures of Hank, a teenager who assists his father in the family's Chinatown grocery store, while also putting up with his mother's crazy schemes to turn him into costumed crimefighter. The story includes the tragic death of a beloved parent, a mystical protective animal spirit, martial arts lessons, and encounters with criminal kingpins and a mysterious woman dressed in red. The tone of the book is lighthearted, the plot alternately slapstick-y and action-packed. Yang's script and Liew's artwork explore and subvert stereotypes about Asian immigrants while also celebrating aspects of Chinese culture. The comic also explicitly plays with the tropes of superhero comics. "Those pieces of the immigrant experience have always been part of this genre," Yang said. "And with The Shadow Hero, Sonny and I wanted to bring them to the surface. We wanted to deal with them directly." For all of the character's obscurity, Yang sees the Green Turtle as fitting squarely within the tradition pioneered by Jerry Siegel and Joe Shuster at DC Comics and Stan Lee, Steve Ditko, and Jack Kirby at Marvel. "I think the immigrant experience is embedded into the conventions of this particular genre," Yang explained. "All the major superheroes — Batman, Superman, Spider-Man, the Hulk, Captain America — were created by the children of immigrants." "Consciously or not, they put their own lives into these characters," he continued. "This dynamic of having two different names is something a lot of immigrants experience. I grew up with a Chinese name at home and another one at school. This idea that you have to hide pieces of yourself when you're out in public is a daily reality for a lot of children of immigrants." As Yang wrote in the afterword about his version of the Green Turtle, "Not only is his identity secret, so is his race." At a time when a female Thor and an African-American Captain America have recently made headlines, Yang is optimistic about comics' progress toward greater diversity in characters and subject matters. "It better lines up the comic book universes with the real world," he said. "We live in a really diverse world, so it's good that our comic books reflect that. When I was a kid, most of the comics available, in my neighborhood at least, were aimed at pre-adolescent and adolescent boys. As a father with daughters, I'm really excited that there are so many comics now that are for girls or both [genders]."